Earlier this week, Disney and YouTube announced a new partnership that looks to bring fresh content to the website of both companies. The partnership comes on the heels of YouTube's new original content plan, a plan that seeks to launch several new channels on the famous video website. The addition of Disney, through Disney Interactive, will help both companies reach younger generations through the online video format. For YouTube, partnering with the Disney name will give the video site a new credibility with families. In a new Disney film created by the folks who made A Christmas Carol last year, nine-year-old Milo (voiced by Seth Green) has to stow away on a spaceship to save his mom (voiced by Joan Cusack) from Martians. Apparently, Mars is low on moms to parent their young and begins stealing moms from Earth. Milo teams up with a tech-savvy earthman named Gribble and a Martian girl called Ki to accomplish his haphazard mission. Check out the trailer for "Mars Needs Moms" below. The film is scheduled to open in 3D, 2D, and IMAX 3D March 11, 2011. One of Disney's most impressive holiday displays is the magnificent creation from the pastry chefs at Disney's Grand Floridian Resort & Spa. 2011 will be the 13th year for the fantasy structure sitting in the Grand Floridian's Lobby, a life size gingerbread house. Walt Disney's love of American history lies throughout the parks, and in Liberty Square at Halloween time ghosts and ghouls frolic amongst park guest on special nights. Though the most obvious of Walt Disney World's spooky sensations is the Haunted Mansion, with its 18th Century Pennsylvania Dutch facade looming high on it's hilltop, Disney also keeps a strong connection to the Legend of Sleepy Hollow. Postcards may be the world's most popular collectible, but at Epcot you have the option of moving your correspondence into the future! At the end of the Spaceship Earth attraction, Siemens' Project Tomorrow gives you the opportunity to send a digital hello to the folks back home. A friend of ours just returned from a cruise on the brand new Disney Dream cruise ship and sent over this great review of the AquaDuck -- the cruise industry's first water coaster on a ship! Thanks to WDWFG for the chance to rave about this incredible water coaster. The AquaDuck may seem like a kids' ride to some, but I was surprised to note that the concept was terrifying to many. Not a lot of folks want to hang out above the ocean with only a thin piece of plastic between them and an 150 foot drop! Disney premiered their new promotion for 2011 on Tuesday night, "The Magic, the Memories and You." The show basically uses Cinderella's Castle as a canvas on which to project a variety of special effect that make a compelling visual effect. It will also feature 500 photos from guests who use the PhotoPass service during the day. 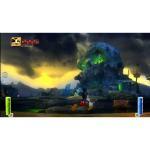 Epic Mickey for Wii has hit store shelves after a long period of anticipation from gamers and Disney fans.